A recent study of pregnant women found new health problems with the pesticide glyphosate, which is the active ingredient in the weedkiller Roundup (made by Monsanto). The researchers found that women with higher levels of glyphosate are more likely to have shorter pregnancies. Another major finding was that almost all the pregnant women (93%) in this study had detectable levels of glyphosate in their urine. I posted about this study earlier, but now it has been published in the journal Environmental Health. All the pregnant women were living in central Indiana (in the cornbelt) in a mix of areas (suburban, urban, and rural), and whether they had well or public drinking water. In case you don't know, it is not good for a baby to be born early, and there can be lifelong health consequences - so every extra week (till full term) is good during pregnancy. The researchers found higher levels of glyphosate in women living in rural areas (farm areas) and those drinking greater than 24 ounces a day of caffeinated beverages. The researchers thought that diet (food) and inhalation of contaminated dust were the major ways that the glyphosate got into the pregnant women. Glyphosate is the most heavily used herbicide (a type of pesticide) in the world. Nearly 300 million pounds were applied in the U.S. in 2015, with much of the application in the Midwest. Scroll down to see a USGS map of glyphosate (Roundup) use in 2015 in the US. You can see that incredibly huge amounts of glyphosate are used in the midwest on farmland - greater than 88.6 pounds per square mile! (it's the dark brown areas on the map). Top crops it's used on are corn, soybeans, and canola, especially genetically modified Roundup Ready crops. It is also used as a dessicant right before harvest ("preharvest") on many crops. This is why crops have glyphosate residues on them, and why so many streams and lakes are contaminated (due to agricultural runoff). About 90% of corn and soybean crops grown in the United States are Roundup Ready, and then these grains are used in most processed foods. Note: glyphosate (Roundup) can not be used on organic crops. The herbicide has been linked to a number of health problems, including cancer, birth defects, endocrine disruption, and reproductive problems. (Posts on glyphosate.) There are currently hundreds of lawsuits from farmers and others claiming that Roundup gave them cancer. ...continue reading "Popular Weedkiller Found In Pregnant Women"
Since my last post on the most commonly used pesticide in the world - glyphosate - there have been a number of important developments. Glyphosate is the active ingredient in the weed-killer or herbicide Roundup, which is manufactured by the chemical giant Monsanto. There have been more questions raised about the safety of glyphosate, and also what went on behind the scenes recently between Monsanto and some officials at the EPA, especially EPA deputy division director Jess Rowland. Was there a downplaying of the pesticide's health effects or squashing of researchers and studies that raised health concerns? (Remember that the International Agency for Research on Cancer, a branch of the World Health Organization, found glyphosate to be a "probable carcinogen" in 2015, but the manufacturer Monsanto has fought long and hard against that designation) Was there corruption? Or ...? Now a published paper by noted researchers (see below) makes the case that the debate over glyphosate remains unsettled and requires further review. The researchers recommend such things as better testing of glyphosate levels and its metabolites in the human body. They pointed out that some studies with rodents found that glyphosate is a carcinogen (can "induce cancers"), and other studies find glyphosate is associated with negative health effects in humans, such as chronic kidney disease and some cancers. Some research suggests that glyphosate is an endocrine disruptor. Also, chemical mixtures can be more toxic than individual chemicals - this is a concern with the chemicals in Roundup. Studies are needed examining people exposed through their occupations (e.g., pesticide applicators), and also "vulnerable populations (e.g., pregnant women, babies, children). The researchers added that current safety standards are outdated and may fail to protect public health and the environment. 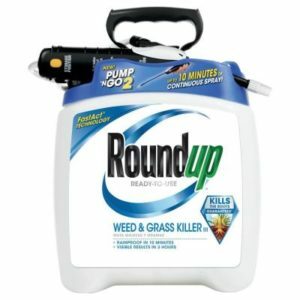 The reputation of Roundup, whose active ingredient is the world’s most widely used weed killer, took a hit on Tuesday when a federal court unsealed documents raising questions about its safety and the research practices of its manufacturer, the chemical giant Monsanto.... A case in federal court in San Francisco has challenged that conclusion, building on the findings of an international panel that claimed Roundup’s main ingredient might cause cancer. The court documents included Monsanto’s internal emails and email traffic between the company and federal regulators. The records suggested that Monsanto had ghostwritten research that was later attributed to academics and indicated that a senior official at the Environmental Protection Agency had worked to quash a review of Roundup’s main ingredient, glyphosate, that was to have been conducted by the United States Department of Health and Human Services. The documents also revealed that there was some disagreement within the E.P.A. over its own safety assessment. But most of the science used to support the safety standards applied in the US was carried out more than 30 years ago, and relatively little of it was subject to peer review, they point out. More than 1500 studies have been published on the chemical over the past decade alone. "It is incongruous that safety assessments of the most widely used herbicide on the planet rely largely on fewer than 300 unpublished, non-peer reviewed studies while excluding the vast modern literature on glyphosate effects," say the experts. And despite the rapid increase in use there is no systematic monitoring system for tracking levels in human tissue, and few studies have looked at potential harms to human health. But recent animal studies have suggested that glyphosate at doses lower than those used to assess risk, may be linked to heightened risks of liver, kidney, eye and cardiovascular system damage. And weed-killers, which combine glyphosate with other 'so-called inert ingredients,' may be even more potent. But these mixtures are regarded as commercially sensitive by the manufacturers and are therefore not available for public scrutiny, say the experts. Excerpt from the BMJ Journal of Epidiomology and Community Health: Is it time to reassess current safety standards for glyphosate-based herbicides? Use of glyphosate-based herbicides (GBHs) increased ∼100-fold from 1974 to 2014. Additional increases are expected due to widespread emergence of glyphosate-resistant weeds, increased application of GBHs, and preharvest uses of GBHs as desiccants. Current safety assessments rely heavily on studies conducted over 30 years ago. We have considered information on GBH use, exposures, mechanisms of action, toxicity and epidemiology. Human exposures to glyphosate are rising, and a number of in vitro and in vivo studies challenge the basis for the current safety assessment of glyphosate and GBHs. We conclude that current safety standards for GBHs are outdated and may fail to protect public health or the environment. Why Is No U.S. Government Agency Testing For This Pesticide In Food? Author SimaPublished on March 24, 2017 October 27, 2017 Leave a comment on Why Is No U.S. Government Agency Testing For This Pesticide In Food? Why is the US Department of Agriculture (USDA) dropping plans to test for glyphosate residues in food? It was supposed to start soon (April 1, 2017), in coordination with the Environmental Protection Agency (EPA) and the Food and Drug Administration (FDA), but now all plans to test have been dropped. Why is this worrisome? The issue is that glyphosate is currently the most widely used pesticide in the world. It is a herbicide that is the active ingredient in the herbicide commonly known as Roundup. Global use was 1.65 billion pounds in 2014 , while overall use in the US was 276.4 million pounds in 2014. Glyphosate is a probable human carcinogen and linked to various health effects, and research shows that glyphosate residues are commonly found in foods. Even though whether glyphosate is a carcinogen is hotly debated by some groups (with Monsanto fiercely fighting against such a label), it shouldn't matter in the decision of whether to test for glyphosate residues in foods. What is going on with our food, and whether and how much glyphosate residues are in food should be monitored. Government agencies (such as USDA) test for other pesticide residues, and they should do the same for glyphosate, especially because it is so widely used. The FDA did test for a short while last year (2016) and then stopped in the fall, and yes, they found residues in the foods they studied. Government and private testing has already found glyphosate residues in breast milk, soybeans, corn, honey, cereal, wheat flour, oatmeal, soy sauce, beer, and infant formula. It is currently unknown what the glyphosate residues in food that we eat means for human health. Several studies have linked glyphosate to human health ailments, including non-Hodgkin lymphoma and kidney and liver problems. Of special concern is that because glyphosate is so pervasive in the environment, even trace amounts might be harmful due to chronic exposure. Glyphosate is patented by its manufacturer (Monsanto) for its antibacterial properties - thus it can be viewed as an antibiotic. What is it doing to our gut microbes when ingested? Some people (including researchers) are even suggesting that much of "gluten sensitivity" or "gluten intolerance" that people complain of, may actually be sensitivity to glyphosate residues in food. There are many unanswered questions. So....is this a case of burying the head in the sand? That there are no problems if no one looks for them? The EPA has long known that glyphosate residues are occurring in food because in 2013 the EPA raised "tolerance limits" for human exposure to glyphosate for certain foods, stating with "reasonable certainty that no harm will result" from human exposure to the chemical. This increase in tolerance levels came about from a request from Monsanto (the manufacturer of the glyphosate herbicide Roundup), and even though numerous groups protested the increase, the EPA went along with Monsanto's request. Some tolerances doubled. Pesticide residues are an important issue - because we don't know what chronic exposure to mixtures of low levels of pesticides (which includes glyphosate) in foods does to us. To babies and children, to pregnant women, to the elderly, to all of us. But remember.... there are very strong industry pressures on the EPA and USDA, with some government officials also having ties to the industry, and so perhaps it's a case of keeping the head firmly in the sand for all sorts of pesticide issues. Maybe the motto is: see no evil...hear no evil....There have been some lawsuits from people claiming harm from the pesticide, as well as push back from scientists and environmental groups. Some influential scientists and physicians came out with a Statement of Concern in 2016 regarding their serious concerns with glyphosate. The reason that glyphosate tolerance limits needed to be increased in the USA is because Roundup Ready crops are now so extensively planted, and this has resulted in skyrocketing use of glyphosate in the last 20 years. Roundup Ready crops are genetically modified to tolerate repeated glyphosate spraying (against weeds) during the growing season. However, the crops take up and accumulate glyphosate, and so glyphosate residues are increasing in crops. Another reason for increased residue of glyphosate in crops is the current practice of applying an herbicide such as Roundup right at the time of harvest to non-GMO crops such as wheat, so that the crop dies at once and dries out (pre-harvest crop dessication), and which is called a "preharvest application" by Monsanto. Glyphosate is now off-patent so many other companies are also using glyphosate in their products throughout the world. The U.S. Department of Agriculture has quietly dropped a plan to start testing food for residues of glyphosate, the world’s most widely used weed killer and the key ingredient in Monsanto Co.’s branded Roundup herbicides. The agency spent the last year coordinating with the Environmental Protection Agency (EPA) and the Food and Drug Administration (FDA) in preparation to start testing samples of corn syrup for glyphosate residues on April 1, according to internal agency documents obtained through Freedom of Information Act requests. Documents show that at least since January 2016 into January of this year, the glyphosate testing plan was moving forward. But when asked about the plan this week, a USDA spokesman said no glyphosate residue testing would be done at all by USDA this year. The USDA’s most recent published report on pesticide residues in food found that for 2015 testing, only 15 percent of the 10,187 samples tested were free from any detectable pesticide residues. That’s a marked difference from 2014, when the USDA found that over 41 percent of samples were “clean” or showed no detectable pesticide residues. But the agency said the important point was that most of the samples, over 99 percent, had residues below the EPA’s established tolerances and are at levels that “do not pose risk to consumers’ health and are safe.” Many scientists take issue with using MRLs as a standard associated with safety, arguing they are based on pesticide industry data and rely on flawed analyses. Much more research is needed to understand the impact on human health of chronic dietary exposures to pesticides, many say. Published on March 24, 2017 October 27, 2017 Categories cancer, nutrition, pesticides, UncategorizedTags glyphosate, herbicide, Roundup, Roundup Ready crops, weed-killerLeave a comment on Why Is No U.S. Government Agency Testing For This Pesticide In Food? What Are the Herbicide Levels In Your Food? Author SimaPublished on February 29, 2016 March 28, 2018 Leave a comment on What Are the Herbicide Levels In Your Food? A very popular herbicide – currently the most widely applied pesticide in the world – is glyphosate, commonly known as Roundup. Global use was 1.65 billion pounds in 2014 , while overall use in the US was 276.4 million pounds in 2014. Glyphosate is a human carcinogen and linked to various health effects, and even though it is so extensively used, the FDA just announced in February 2016 that they will “soon” start testing for its presence and actual levels in food for the first time in the agency’s history. What, it never occurred to them that the most widely used pesticide in the world would be found in food? Of course they knew glyphosate residues were occurring in food because in 2013 the EPA raised "tolerance limits" for human exposure to glyphosate for certain foods, stating with "reasonable certainty that no harm will result" from human exposure to the chemical. This increase in tolerance levels came about from a request from Monsanto (the manufacturer of the glyphosate herbicide Roundup), and even though numerous groups protested the increase, the EPA went along with Monsanto's request. Some tolerances doubled. Private testing has already found glyphosate residues in breast milk, soybeans, corn, honey, cereal, wheat flour, soy sauce, and infant formula. It is currently unknown what glyphosate residues in food, which we then ingest, mean for human health. Several studies have linked glyphosate to human health ailments, including non-Hodgkin lymphoma and kidney and liver problems. Of special concern is that because glyphosate is so pervasive in the environment, even trace amounts might be harmful due to chronic exposure. Some people (including researchers) are even suggesting that much of "gluten sensitivity" or "gluten intolerance" that people complain of, may actually be sensitivity to glyphosate residues in food. So where have glyphosate residues been found recently? In Germany's 14 most popular beers. German beer purity in question after environment group finds weed-killer traces And in feminine hygiene products in France. How to lower your daily intake of glyphosate? Eat organic foods as much as possible, including wheat, corn, oats, soybeans. The broad-spectrum herbicide glyphosate (common trade name “Roundup”) was first sold to farmers in 1974. Since the late 1970s, the volume of glyphosate-based herbicides (GBHs) applied has increased approximately 100-fold. Further increases in the volume applied are likely due to more and higher rates of application in response to the widespread emergence of glyphosate-resistant weeds and new, pre-harvest, dessicant use patterns. GBHs were developed to replace or reduce reliance on herbicides causing well-documented problems associated with drift and crop damage, slipping efficacy, and human health risks. Initial industry toxicity testing suggested that GBHs posed relatively low risks to non-target species, including mammals, leading regulatory authorities worldwide to set high acceptable exposure limits. To accommodate changes in GBH use patterns associated with genetically engineered, herbicide-tolerant crops, regulators have dramatically increased tolerance levels in maize, oilseed (soybeans and canola), and alfalfa crops and related livestock feeds. Animal and epidemiology studies published in the last decade, however, point to the need for a fresh look at glyphosate toxicity. Furthermore, the World Health Organization’s International Agency for Research on Cancer recently concluded that glyphosate is “probably carcinogenic to humans.” In response to changing GBH use patterns and advances in scientific understanding of their potential hazards, we have produced a Statement of Concern drawing on emerging science relevant to the safety of GBHs. Our Statement of Concern considers current published literature describing GBH uses, mechanisms of action, toxicity in laboratory animals, and epidemiological studies. It also examines the derivation of current human safety standards. We conclude that: (1) GBHs are the most heavily applied herbicide in the world and usage continues to rise; (2) Worldwide, GBHs often contaminate drinking water sources, precipitation, and air, especially in agricultural regions; (3) The half-life of glyphosate in water and soil is longer than previously recognized; (4) Glyphosate and its metabolites are widely present in the global soybean supply; (5) Human exposures to GBHs are rising; (6) Glyphosate is now authoritatively classified as a probable human carcinogen; (7) Regulatory estimates of tolerable daily intakes for glyphosate in the United States and European Union are based on outdated science. We offer a series of recommendations related to the need for new investments in epidemiological studies, biomonitoring, and toxicology studies that draw on the principles of endocrinology to determine whether the effects of GBHs are due to endocrine disrupting activities. We suggest that common commercial formulations of GBHs should be prioritized for inclusion in government-led toxicology testing programs such as the U.S. National Toxicology Program, as well as for biomonitoring as conducted by the U.S. Centers for Disease Control and Prevention. Published on February 29, 2016 March 28, 2018 Categories healthy living, nutrition, pesticidesTags glyphosate, herbicides, pre-harvest crop dessication, preharvest application, Roundup, Roundup Ready cropsLeave a comment on What Are the Herbicide Levels In Your Food?